In 1794 Giovanni Presta from Salento developed the first handbook on Olive Oil. The subtitle of the book was : before you start producing olive oil define well if your priority is quality or quantity ("o si ri guardi di primo scopo la massima perfezione, o si riguardi la massima possibile quantita del medesimo"). We totally agree on this statement and we think that high quality can only be achieved with an handmade approach. 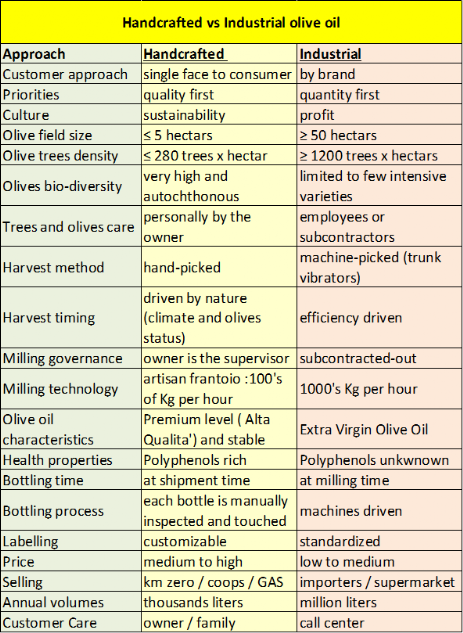 To better explain the difference we have developed this table to differentiate Handcrafted or Artisan olive oil (Olio artigianale) vs Industrial olive oil (Olio Industriale). See the table on the right. The process of transforming olives into oil is magic: from a mechanical and natural milling process (frantoio), after about one hour you get the best food on Earth from crops that you cannot eat directly. In italy there are 4700 frantoi. This huge number significantly contributes to the quality of olive oil. Every frantoio produces in average less than one fifth of olive oil produced by an equivalent one in Spain (boutique approach to quality). All our guests visiting us have all requested a guided tour to a milling farm, therefore we have developed a complete guide on how a olive mil operates.